Tamara Mellon is an American luxury footwear company created by the designer of the same name. After co-founding Jimmy Choo, Mellon started her own company and redefined fashion. The shoes in the collection are showing a new way to design and show off shoes. With Big Apple Buddy’s personal shopping service, you can now buy direct from the Tamara Mellon online store anytime, anywhere. 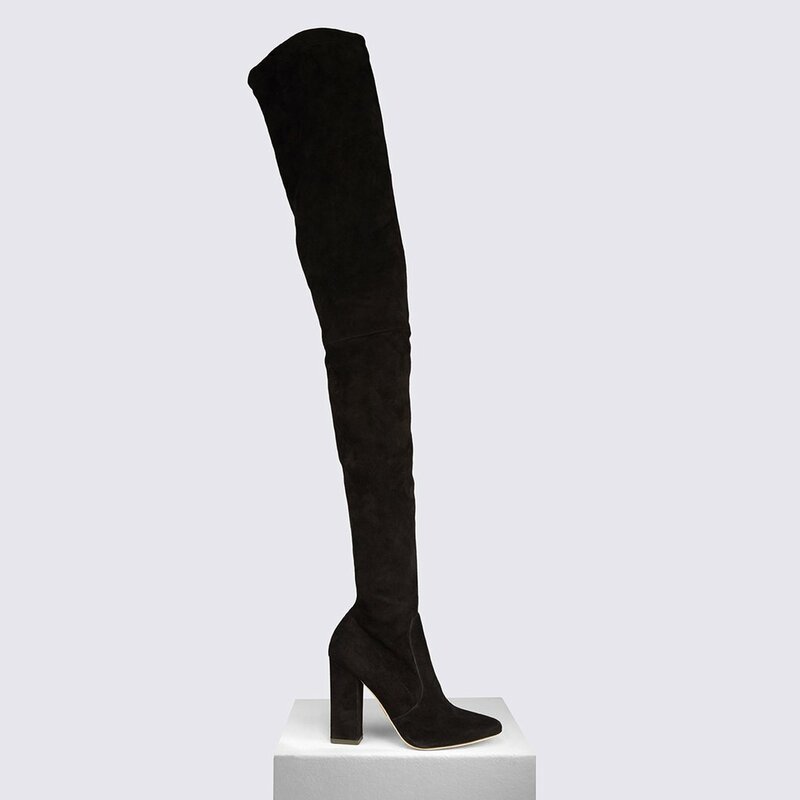 Indulge in the feel of the Helmut Stretch Suede boots from Tamara Mellon! These shoes are meant for showing off - with a thigh-high style and a high heel, you'll have everyone looking. It'll go perfect with a dress or skirt for those fancy nights out and if it's cold outside, you'll be covered for sure. The stretch suede makes the boots even more comfortable so you'll look great and feel great! Take a risk that's worth it with the Linger Velvet shoes from Tamara Mellon! It has skin-baring cutouts for a unique touch when you want to reveal just a little bit more. Handcrafted in Italy, these shoes are guaranteed to be durable as well as comfortable so the fun night doesn't have to stop. The high heel gives you that alluring boost that will upgrade your outfit no matter what the occasion is. Get the best of both worlds with the Tamara Mellon Sweet Revenge-Suede! This all-in-one pant and shoe hybrid is changing the way we think about fashion. The legging goes up to your waist for a comfortable fit while the shoe part has a medium heel to provide just the right amount of height. One of the most popular items in the collection, everyone is trying to get the revolutionary hybrid ASAP! Unfortunately, the USA Tamara Mellon online store does not currently offer international shipping. However, Big Apple Buddy, your personal shopper, can help you buy products direct from the official USA Tamara Mellon online store and ship them to your doorstep, no matter where you are in the world. We offer international shipping to over 110 countries including Australia, Austria, Azerbaijan, Bahrain, Belgium, British Virgin Islands, Brunei, Bulgaria, Canada, Chile, Costa Rica, Croatia, Czech Republic, Denmark, Estonia, Fiji, Finland, France, French Polynesia, Germany, Gibraltar, Greece, Greenland, Hong Kong, Hungary, Iceland, Indonesia, Ireland, Israel, Italy, Japan, Jordan, Kuwait, Latvia, Liechtenstein, Lithuania, Luxembourg, Macau, Malaysia, Maldives, Malta, Marshall Islands, Mauritius, Monaco, the Netherlands, Netherland Antilles, New Zealand, Norway, Oman, Poland, Qatar, Romania, San Marino, Saudi Arabia, Serbia and Montenegro, Seychelles, Singapore, Slovak Republic, Slovenia, Spain, South Africa, St. Lucia, Sweden, Switzerland, Taiwan, Thailand, the UAE, the UK, Vatican City, and Vietnam. If you would like to buy from the USA Tamara Mellon online store, simply let us know which items you would like to order (by filling out the form below) and we’ll get back to you with a free international shipping quote within 24 hours!